Questions? Go ahead and try us. Why should I choose Georgia Natural Gas®? As Georgia’s leading natural gas provider, we have more than 20 years of experience providing exceptional service, fantastic savings and simple solutions that make natural gas easy to understand. Above all, we’re dedicated to putting your needs first. Always. So you can enjoy peace of mind without natural gas being on your mind. Does Georgia Natural Gas® require a contract? By accepting gas service from us, you agree to our Terms and Conditions of Service . When you select a fixed price or flat bill plan, you are entering into a contract to remain on the plan for the length of your agreement. If I choose the Budget Billing Plan, how is my budget amount calculated? Factors included in calculating your new budget payment amount are estimated gas usage for the next 12 months, anticipated gas prices, weather and other charges that will appear on your bill. We also use your variance - the difference between what you paid on the plan and your actual gas charges - as one factor in calculating your new monthly payment for the next budget period. For more details, login to your account or call us at 877.427.4321. Does Georgia Natural Gas® need my Social Security number when I sign up? Although the law does not require you to provide your Social Security number for identification purposes, we must have your social security number to complete a credit check and to process your application. We will not use it for any other purpose. What are my payment options with Georgia Natural Gas®? Go to our payment options to see all the ways you can pay your bill. Does Georgia Natural Gas® offer special discounts for low-income customers? Senior citizens who qualify through Atlanta Gas Light Company for a reduced AGLC base charge will receive a discount of up to $14.00 per month off that charge. In addition, we offer qualifying seniors a discounted per-therm rate. To qualify, you must be 65 or older with a combined household income of $24,980 or less. Apply using this form: Senior Discount Application. Or you can also call us to request an application at 770.850.6200 (metro Atlanta) or toll-free at 1.877.850.6200 (outside metro Atlanta). If you are currently receiving a senior discount from AGLC, remember to mention it when enrolling with Georgia Natural Gas. Contact AGLC regarding either of the following issues: Gas leaks or other natural gas-related emergencies or meter problems. In metro Atlanta, call 770.994.1946 or 770.907.4231. Outside metro Atlanta, call toll-free 1-800-GAS-LINE (1-800-427-5463). If I have chosen another marketer but would like to switch to Georgia Natural Gas®, is there a fee to switch? You have the right to switch to GNG from another gas marketer at any time. Just call us at 770.850.6200 (metro Atlanta) or toll-free at 1.877.850.6200 (outside metro Atlanta) and request that your gas service be switched to GNG. You are allowed one marketer switch per 12-month period at no charge. You may be assessed a switching fee by your new marketer if you make more than one marketer switch within a 12-month period. What is my gas price per therm? Your price per therm depends on what price plan you selected. Under a variable price plan, you pay for the gas you use each month a price that may change or remain the same from month to month based on market conditions. Under a fixed price plan, you pay for the gas you use at a price per therm that is guaranteed for the length of your agreement, eliminating monthly fluctuations in price. Why does my bill reflect ‘0’ therms of gas consumed or ‘no reading’? If the gas usage on your bill is zero, that means you did not consume any natural gas during the billing period. If your usage says ‘no reading,’ that means we did not receive a meter reading from Atlanta Gas Light Company (AGLC). What does the term Designated Design Day Capacity (DDDC) mean? Designated Design Day Capacity is calculated annually by Atlanta Gas Light Company (AGLC) and is based on your demand on the system on the coldest day of the year. What should I do if I want to terminate service with GNG? If you are moving within Georgia, out of Georgia or otherwise want to terminate service, you must give GNG at least 10 business days advance notice by phone. The number inside metro Atlanta is 770.850.6200; outside metro Atlanta the toll-free number is 1.877.850.6200. After you make the required phone call, you may submit a written request for termination to Georgia Natural Gas, P.O. Box 440667, Kennesaw, GA 30160-9512, or notify GNG via e-mail at customerservice@gng.com. Please note GNG is not responsible for written or electronic correspondence sent to the wrong address. If you do not notify GNG by telephone that you want to terminate service, GNG will continue service until such notice is received. In either case, you will be responsible for paying all charges incurred until the time of termination. Some properties and customers may not have sufficient gas usage history, or the usage patterns at the properties may not allow us to accurately forecast normal gas usage patterns. In these rare cases, those properties and customers will not be eligible for the Guaranteed Bill plan. GNG also considers credit and payment history in determining eligibility for the plan. How do you calculate my Guaranteed Bill amount? GNG looks at the past gas usage at your premises, adjusts that usage to account for weather and then estimates the amount of gas you will use in the next 6 or 12 months, depending on which term you selected. We then consider expected natural gas prices and other costs and market considerations to determine your total amount for the term of your agreement. This amount includes your Atlanta Gas Light Company (AGLC) Base Charge, which are costs that are passed through directly from AGLC, the GNG Customer Service Charge and Gas Charge. This amount does not include taxes or one-time charges such as connection or late charges. That calculation provides a total amount for the term of your agreement which is then simply divided by the number of months in the term of your agreement to get your monthly Guaranteed Bill amount. View an example of a Guaranteed Bill plan billing statement. How is the Guaranteed Bill plan different than just signing up for a budget billing payment option? Similar to Guaranteed Bill, budget billing provides you a flat monthly bill amount. However, with Budget Billing, if your gas price or usage is different than expected, there will be a reconciliation or true-up. There will never be a true-up with a Guaranteed Bill plan. Additionally, with budget billing, your bill can be adjusted at any time due to extreme market conditions. With a Guaranteed Bill plan, you pay the same flat amount each standard service period for the term of your agreement, GUARANTEED! Will my Guaranteed Bill Charge change during the term of my agreement? No. GNG guarantees that your charge will remain the same for each standard service period during the term of your agreement, regardless of changes in gas prices or weather. But please note that in some instances, such as when you are establishing new service or changing providers, your service period may be outside of the standard 27-33 days. If that happens, we will prorate your bill to reflect a more accurate amount for the time period of the bill. Click here for more information about proration. What is Proration and why does GNG do it? Your gas meter is generally read on a regularly scheduled basis by AGLC. Typically, the time between meter readings (called service periods) is 27-33 days. As long as your service period is within that normal range, we will charge you your Guaranteed Bill amount regardless of how much gas you use that month. However, sometimes other factors, such as when you start new service with us, can cause your service period to be less than 27 days (or greater than 33 days). We do not think it would be right to charge you a full Guaranteed Bill amount for an unusually short time period. For example, if you start with GNG on the 1st of the month, and your meter is read on the 3rd, this service period would be only 3 days. In those instances, your bill will be prorated to reflect the actual duration of your service period. If your billing period spans longer than 33 days, it will also be prorated. What happens after my Guaranteed Bill plan expires? If you sign up on a 12-month Guaranteed Bill plan, for your convenience, at the end of your term, we will automatically renew your agreement on the Guaranteed Bill plan for another 12 months, subject to your continued eligibility. You’ll also have the option to sign up on any other plans you are eligible for. At the end of their term, customers who enrolled on a 6-month Guaranteed Bill plan (or on a 12-month Guaranteed Bill plan prior to Feb. 5, 2019) can change to another eligible price plan. If you do nothing, you will automatically be placed on our Standard Variable Select plan which does not have a long-term contract, so you can choose another plan at any time. Will my Guaranteed Bill amount change if I re-enroll after the term of my agreement? When you call back to renew, we will confirm your eligibility and recalculate your Guaranteed Bill amount. We will estimate the amount of gas you will use in the subsequent Guaranteed Bill plan term period based on your most recent usage patterns, and accounting for the impact of weather during that time. Your newly quoted Guaranteed Bill amount may be different than your previous Guaranteed Bill amount based upon multiple factors, including without limitation gas prices at that time, your new predicted usage and the term of your prior agreement as compared to your new agreement. Please note, any changes to your quoted Guaranteed Bill amount will NOT include a “true up” from your prior agreement. After receiving your Guaranteed Bill quote you will have the option of reenrolling on a currently available Guaranteed Bill plan or selecting another one of our price plans. If you have changed your heating patterns excessively, it may affect your ability to re-enroll on a Guaranteed Bill Plan. After all, if we can’t predict your usage, we can’t offer you a new guaranteed amount. What happens if I choose to cancel this agreement? If you choose to leave the Guaranteed Bill plan before the agreement is over, you will be charged an Early Termination Charge. This charge is intended to compensate GNG for losses and expenses we estimate we will incur as the result of this cancellation. Early Termination Charge may be waived for customers who voluntarily disconnect their service within 45 days of the expiration date of their agreement while active on GNG’s Seasonal Savings Program and under other limited circumstances as detailed in your Terms and Conditions of Service. Please click here for more information about Early Termination Charge amounts. Why should I consider GNG's Guaranteed Bill plan? 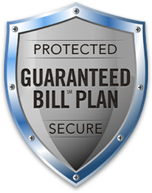 The Guaranteed Bill plan is a unique type of product, providing more security and convenience than any other plan in the market. No other plan protects you from higher than expected bills when the weather is cold. This plan guarantees that you will not be charged more, even in the coldest months. In other words, this plan is weatherproof. If you sign up on a Guaranteed Bill plan, fluctuations in weather or natural gas prices will not change your Guaranteed Bill amount for the entire term of your agreement. You can have confidence in knowing exactly what your gas bills will be, and enjoy the security and protection against cold weather causing unexpected high gas bills. Will I save money on the Guaranteed Bill plan? You may or may not save money on the Guaranteed Bill plan, but you will get peace of mind. Because no one can predict the weather and the changing price of natural gas, we created Guaranteed Bill so you don't have to worry about how those uncontrollable factors will affect your bill. We guarantee your amount regardless of what the weather does or how much the price of natural gas changes. Guaranteed Bill plan may not always save you money, but it will always save you from worry—and that peace of mind is priceless. If I enroll on the Guaranteed Bill plan, can I use as much gas as I want? At GNG we do not encourage the wasteful use of gas. The flat guaranteed amount you are given is calculated based on historical usage patterns at your premises. However, we understand that your gas use will change as the weather changes. If it is very cold, of course you will use more gas than you normally would. With Guaranteed Bill, we expect that, and you will be fully covered. Excessive changes in consumption not related to the weather are not considered normal usage on a Guaranteed Bill plan. Examples could include adding an addition to your house, heating a new pool all winter, or turning your house into a "sauna" by setting your thermostat to an unusually high temperature. In extreme cases, if a customer used significantly more gas than we would expect given the weather, we reserve the right to terminate you from the plan and put you on our standard Variable Select plan. Again, increases in use due to cold weather are included with your plan and you will never be terminated because you used more gas due to extreme cold. However, excessive changes such as those listed above are not included in your plan. More details are available in your disclosure statement which is a part of your welcome letter. What happens if rates go up? If rates* in the future months go higher than today's rate, you'll only pay today's rate for up to 12 months - that's one benefit of adding the Price Protection Guarantee. What happens if rates go down? If rates* in future months go down, you'll automatically pay the lower rate. And that can add up to big savings! It is a service that you may cancel at any time without penalty. How is the Price Protection Guarantee different from a fixed price plan? The Price Protection Guarantee is a service that can accompany your Variable Select plan, and it does not require a long-term contract. If rates go up or down, your rate does not- you are 'locked in' with the rate you agreed to pay at the beginning of the contract. A fixed price plan does require a contract and sets a fixed price per therm for the duration of the contract. In addition, fixed price plans have an early termination charge should you choose to end your contract before the expiration date. Why is GNG offering this service? Many GNG customers love the flexibility that comes with a variable price plan and want to continue enjoying the savings when the rates* go down, but they also want to be protected against rising rates, particularly in the winter months when their usage is higher. The Price Protection Guarantee gives you the benefits of both flexibility and protection. I am a residential GNG Customer, but am not currently on the Variable Select price plan. May I add the Price Protection Guarantee? At this time, the Price Protection Guarantee is only available to customers in good standing on the Variable Select plan. However, you should call our Customer Care team to find about your options. I am a residential GNG Variable Select plan customer on Budget Billing. Am I eligible to add the Price Protection Guarantee Signature Service? Yes, you may add the Price Protection Guarantee. I am a Small Business GNG Customer. May I add the Price Protection Guarantee service, and how much does it cost? If you are not under a contract and are a Variable Select price plan customer in good standing, you certainly can, and the cost is just $1.99 per month. I still don't get it...can you explain a little more? Gladly. The natural gas market is complex, and we do our best to make it simple and easy to understand for our customers. With a variable price plan, the rate (also call the "therm rate", "per-therm rate", or "price per therm") you pay each month can fluctuate as market conditions change. Dropping rates are great for variable price plan customers, but rising market rates can create worry and are difficult to predict and budget for. When you sign up for Price Protection Guarantee with GNG, – the variable rate* in effect at the time you sign up becomes your "cap" or "ceiling" for the next 12 months; your rate can go down, but it cannot go above that rate. Who can earn miles as part of the SkyMiles partnership between Georgia Natural Gas and Delta? GNG customers in good standing who are on any of GNG's published residential or commercial price plans and are also SkyMiles members are eligible to start earning miles. How many miles will I earn? When will my miles be posted to my Delta SkyMiles account? Customers on our Guaranteed Bill Plan will receive two miles for every dollar spent on their monthly Guaranteed Bill charge. Customers on any other plan will receive miles for every dollar spent on their monthly GNG customer service charge, gas charge, GNG Signature Service charge (if any), and interstate pipeline capacity charge (if any) found on your GNG bill (but not the AGLC Base Charge). Plus, if you are a Delta SkyMiles Medallion® member, Delta will award an additional mile for every eligible dollar. Miles will not be awarded for taxes or one-time charges such as late fees. Miles will be posted to your SkyMiles account up to 4 weeks after full payment of your GNG bill, provided you remain in good standing in the SkyMiles program. I am not a Delta SkyMiles member. How do I become a Delta SkyMiles member so I may start earning miles as a GNG customer? I have multiple GNG Accounts. May I earn miles for each GNG account? Yes. Simply fill out the form at gng.com/skymiles for each of your GNG accounts. You may elect to have each of your GNG accounts distributed to a single or multiple SkyMiles accounts as you wish. May I direct the miles that I earn through GNG to someone's SkyMiles account other than my own? Yes. Simply enter the SkyMiles member name and account information above, or call GNG Customer Care toll-free at 8554GNGMILES (8554464645). Do the miles earned through Georgia Natural Gas count toward Medallion status as Medallion® Qualification Miles (MQMs)? If my GNG miles are not posting to my SkyMiles account who do I contact? Please contact us at 855.4GNGMILES (855.446.4645) and we will check on the status. However, if you have recently signed up, please keep in mind it may take up to 4 weeks after full payment of your bill before miles start posting to your SkyMiles account, provided you remain in good standing in the SkyMiles program. I'm already a part of the TrueBlue Schools program with Georgia Natural Gas; may I still earn miles as part of the Delta SkyMiles partnership? Unfortunately, GNG customers are limited to one partnership program at a time. I have a question not listed here about the Skymiles Program. Who can I contact?